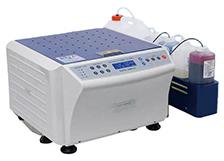 The Dagatron Multi Stainer provides fast, easy and reliable staining for a variety of specimens, using a fully automated system. The Multi-Stainer machines are able to perform up to 3 staining methods in one system with a choice of Gram, Ziehl-Neelsen, Fluorescence, Kinyoun and Haematology (MGG & Wrights) staining options. With a small footprint, easy operation and a capacity of up to 20 slides per stain this is the ideal multi-function automatic staining machine. For more information, see our Diagnostic Staining Automation page.